You know you've been reading too much paranormal fiction when you crack open a book that starts with a naked, blood-splattered amnesiac heroine waking up next to a dead body and you think, "oh this old thing again??" Marjorie Liu's Wild Road comes to mind, but I'm sure there have been others. Hasn't there? Help me out here. 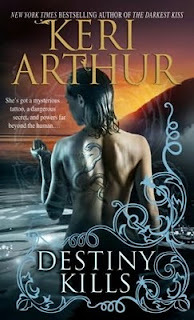 Keri Arthur's new-ish series, Myth and Magic, is not too bad but not as good as I might have hoped, given how in love I have been with the Riley Jenson series --in fact, I mistakenly bought this book last summer thinking it was part of the Jenson series. Sharp characters and imaginative world-building save this story from a mediocre plotline of paranormals on the run from evil scientists performing unspeakable experiments. The hero is a pretty classic Bad Boy, with a touch of the Charmer (honestly, I think there's a lot of overlap in the eight classic archetypes). Trae as a hero hits all the right notes for me -- he's strong, smart, ingenious, funny, ruthless with the bad guys and tender with the heroine. He's not a masculine Mary Sue -- he's got his own agenda and he doesn't always play fair, but Destiny doesn't let him get away with it. Two thumbs up for Trae. Destiny is harder to peg. She's more vulnerable than I generally like in a heroine, but that's consistent with the story set up -- she's spent the last third of her life in captivity, washing up on shore with no clothes, no money, and no ID. She's a paradoxical mix of innocence and cynicism, also consistent. This book came out near the end of the Jenson series and I felt like Destiny's voice wasn't as separate from Riley's as it could have been, but Destiny is younger and a bit softer. Her most interesting qualities, I think, are her supernatural abilities. As a sea dragon, she has certain powers over bodies of water -- now, I've seen this trope before-- for example, with Alyssa Day's Warriors of Atlantis-- but Arthur gives it a unique and intriguing spin. I particularly liked the sense of antiquity around Arthur's dragon mythology -- there's a bit of mysticism and ritual that gives it a nice distinction from the gritty, no-frills Jenson series. The next book is due out in April and follows Trae's sister, so it's looking more like a paranormal romance series than the one-heroine UF style Arthur brought us with Riley Jenson and, later next year, Risa Jones whom we met as a child in Riley's series. As I alluded to, I was a little disappointed with the tired plotline -- it's a rehash for PNR in general, and Arthur herself has already done it-- and the two-dimensional badness of the villains. Ambiguous evil is so much more interesting. And this is a nitpick, but I wish the author had come up with some menacing corporate sort of name for the research group -- calling them "the scientists" throughout the book was a bit off-putting and anti-intellectual to me, since I prefer to think of scientists in general as good guys. Bottom line, it looks like a promising series with a solid, if not outta-the-park debut. I'll be picking up the book in April for sure.